The Mulholland Bridge above the 405 Freeway. The 405 Freeway will be shut down in both directions between the San Fernando Valley and the Westside for more than 50 hours during the weekend of July 15. Lanes closures on the 405 Freeway will begin Friday night. The freeway will not reopen until 5 a.m. the following Monday, July 18, officials said. The project means hundreds of thousands of motorists will have to be detoured or convinced not to travel on the 405. The project is significant enough that it has its own public relations program. A news conference is scheduled for later this month as part of an effort to spread word of the closure, which was the subject of a statement/warning issued Friday on Supervisor Zev Yaroslavsky's website. Expect to see newspaper ads, too. The closure is needed so crews can tear apart half of the Mulholland Drive overpass, which was built in 1960. Mulholland traffic will be detoured to the other half of the overpass until the replacement is finished. That will require another weekend-long demolition closure next summer. 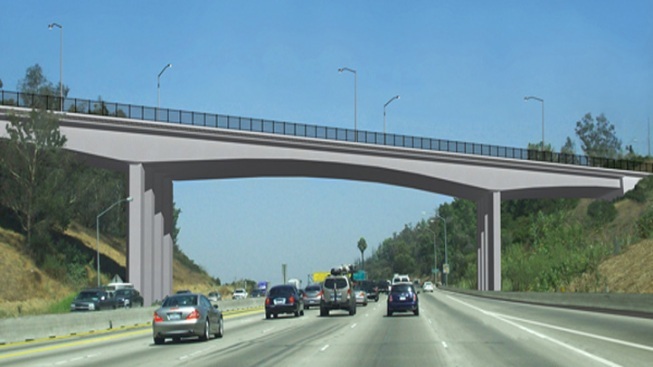 The construction is part of a freeway widening project that will add northbound carpool lanes and remodel the 50-year-old freeway's bridges and ramps.